Under the motto "Working for Future Technology", the HEINKEL Drying and Separation Group is presenting complete system solutions and components for solid-liquid separation for the chemical, fine chemical, pharmaceutical and food industries in Frankfurt am Main, Germany, from June 15 to 19, 2015. Visitors can look forward to experiencing product highlights, turn-key industrial solutions, expert consulting services – and the entire expertise in filtration, centrifugation, mixing, agitating and drying of the group with its brands BOLZ-SUMMIX, COMBER, HEINKEL and JONGIA. At ACHEMA 2015 the HEINKEL Drying and Separation Group will be presenting highlights and selected models from its extensive product range for the chemical, fine chemical, pharmaceutical and food industries. With around 4000 exhibitors from more than 50 countries ACHEMA is the world’s leading international show of the process industry. Every three years, the sector’s market leaders come together in Frankfurt am Main to present their products and services from branches such as engineering, research and development, laboratory and analytical techniques, mechanical processes, instrumentation, control and automation, pharmaceutical, packaging and storage technologies, thermal processes, materials technology as well as biotech equipment and environmental protection. As one of the few suppliers of complete systems for processes in solid-liquid separation, the HEINKEL Drying and Separation Group combines the expertise in filtration, centrifugation, mixing, agitating and drying. This enables effective process engineering solutions for different applications – from laboratory devices to complex production facilities. 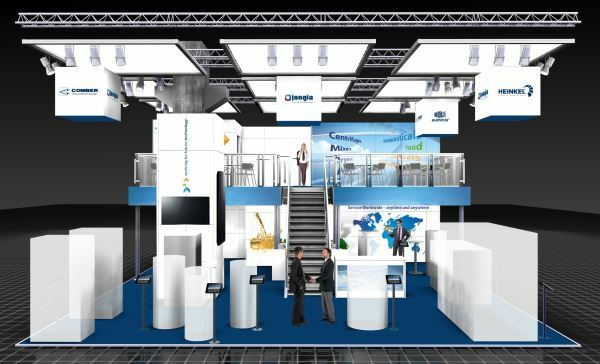 The HEINKEL Drying and Separation Group’s fair stand at ACHEMA 2015 will cover around 170 square meters on two storeys and is the base from which the corporate group will be presenting, amongst others, an extension of its successful inverting filter centrifuge, central-shaft mixers and lab dryers as well as its great expertise in the after sales sector. Furthermore, visitors can look forward to the innovative Magitator, an agitator with magnetic coupled drive, as well as the latest generation of HMI panels. In addition to detailed information on products and services, visitors will be given comprehensive individual advice from the corporate group's technical experts.